I have a bit of an obsession with Oregon Chardonnay, and this wine is among my favorites. You might remember that last year I paired the 2013 Knudsen Chardonnay with this delicious smoked whole chicken. So I was excited to come up with something different to pair with the newest release of this wine, the 2014 vintage. I tasted it a couple months ago at the Cascadia Wine Competition, where I served as a wine judge, and discovered it’s style. Similar to last year, the wine is oaked, but just the way I like it — mildly oaked, not in-your-face. The oak is a seasoning, not the main ingredient. Which brought me to crab. I wanted to pair this wine with seafood. Something that had some richness, but not too much. Something we could put on the smoker, but without any intense smoke flavor dominating. Salmon kept popping in my head too. But salmon alone, I thought, would be a bit too strong of a flavor for the wine. Crab cakes could be fun, but to be honest, I dislike most crab cakes out there. They tend to be too rich, and involve too much mayonnaise used to bind everything together and give it extra richness, which just makes my stomach feel gross. And to be blunt, I hate mayonnaise. But what if we could find a better way to bind everything together without it being an oily grease bomb and without needing egg? After reading an article on Food.com, which showed some smoked salmon sandwiched in the middle of a crab cake, we decided to smoke a small salmon fillet, and use that to mix with the crab meat. This also helped stretch the crabmeat, since Dungeness crab is some expensive stuff! Sheesh!! We flavored the salmon simply, with some Dijon mustard, salt and pepper, and smoked it for about 90 minutes. We then combined the salmon with the crab and other ingredients to make the cakes. The salmon itself was rich and moist with a natural oily texture inside. We wouldn’t need to go overboard with extra binding. We did add just a tiny bit of mayonnaise (just a touch! ), and some Dijon (because I friggin’ love Dijon) to assist with the binding. This worked out perfectly. No egg needed. Because I knew we were dealing with an elegant wine, I didn’t want to overpower the mix with a lot of extra flavorings or seasonings. Instead we kept it simple with some green onions and red bell pepper for texture and crunch, lemon juice for freshness, and a pinch of smoked paprika for color and flavor. Though I wouldn’t object to you adding some dry red pepper flakes or a few dashes of hot sauce for a little kick. After you mix everything together taste and adjust to your preferences. Since there’s no raw egg in the mix you can taste and adjust the flavors until you’re happy with the mix. Then roll into medium sized cakes. I used an ice cream scooper to create 2” cakes, and then fried in shallow amount of canola oil. The freshness of the Dungeness crab and the smokiness of the salmon take center stage, and aren’t overshadowed by too many fillers that can come from a mayo overdose. There’s great moisture in the cakes, but it’s all coming naturally from the meat (not mayo). You still can feel the texture of the meat along with the crunchiness of the bell peppers and onions. The size of the cakes is perfect as an appetizer, or served over some greens for a light dinner. But how did it go with the wine? Find out below. A smoky twist to a traditional crab cake. Smoked salmon fillet meets Dungeness crab to create incredible flavor and moisture for the ultimate salmon-crab cakes. Preheat smoker to 225 degrees, with cherry or apple wood. Rub salmon with the Dijon mustard then season with the salt and pepper. Place on smoker for about 90 minutes or until the interior of the salmon is moist and slightly pink. Remove, and once cooled, break up the pieces and discard any bones that might remain. Combine the crabmeat and salmon together. Add the red bell pepper, green onion, mayonnaise, Dijon mustard, lemon juice, breadcrumbs, salt, pepper, and smoked paprika. Taste and adjust any seasonings to your preference. Heat about 2 tablespoons of canola oil in a large nonstick skillet (the amount of oil used will be based on how large your pan is. You want to coat the pan with a little excess oil). Using an ice cream scooper (or similar size spoon), to scoop out and form the mixture into a 2” diameter cake and flatten slightly. In batches of 3-4 patties, sauté on each side for approximately 2 to 3 minutes or until golden brown. Remove and place on a paper towel to soak up any excess oil. Serve immediately with your favorite dipping sauce. For the freshest flavor use fresh lump Dungeness crab meat, and freshly smoked salmon. The size of the cakes is perfect as an appetizer, or serves over some greens for a light dinner. For those who may be unfamiliar with this producer, the name Knudsen has become nearly synonymous with some of the best sparkling wine to come out of Oregon (up until recently all of the fruit from their 130 acre vineyard went exclusively to Argyle Winery for their sparkling wines). 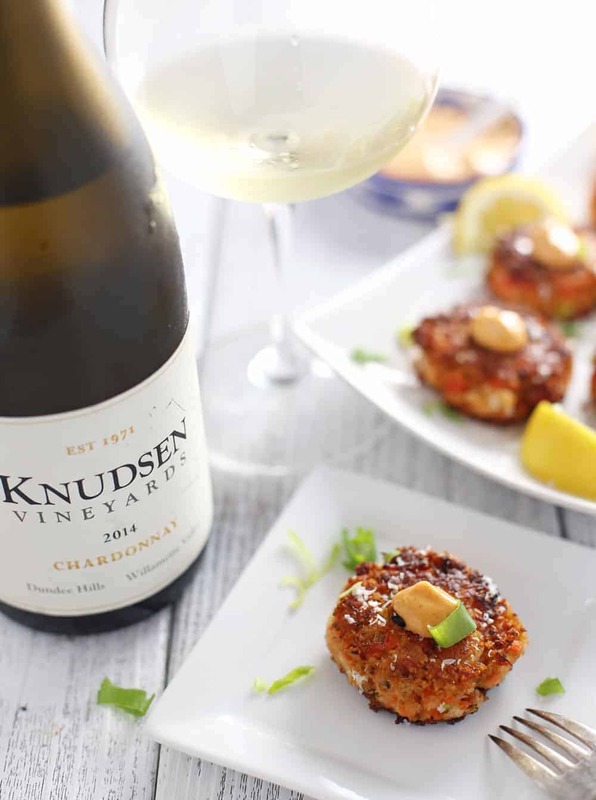 Knudsen’s second generation has decided to start their own label — making Pinot Noir and Chardonnay — to honor the pioneering spirit of their late parents, Cal and Julia Lee Knudsen. You can read more about them in this post. They currently produce only two wines, a Pinot Noir and this Chardonnay. This is the second release of their Chardonnay. This Chardonnay spent 12 months in mostly older French oak barrels (only 20% new oak), and 6 months in bottle prior to release. This gave the wine just enough wood for some structure and some gorgeous savory notes, but left it overall fresh, refreshing, and clean. Only 260 cases produced (which is 160 more than last year… meaning more Chardonnay love for us all!). The wine tasted fairly light at first, but if you give it some time it opens up amazingly and reveals some gorgeous lemon, lemon peel, apple, and mineral undertones. Like I mentioned above it has some oak, but it’s mild, not in-your-face. The oak is a seasoning, not the main ingredient, offering a touch of vanilla, spice, and even a hint of butterscotch (yum!). The mineral notes and savory feel are quite intriguing, and long lasting. 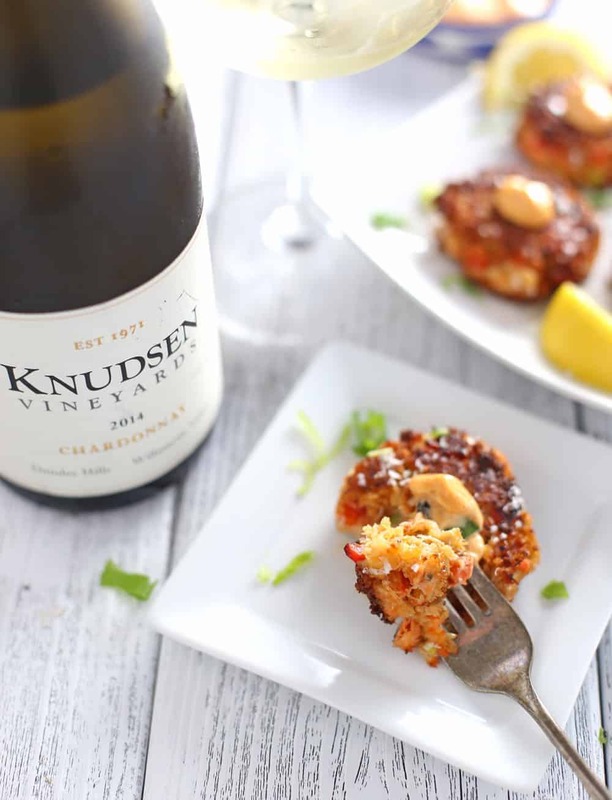 The wine had just enough weight to stand up to the dish, but also had great bright acidity, which was a perfect match for the richer qualities of the crab cakes, cutting through the creaminess of the dish and refreshing the palate. Damn this is a pretty wine! This is an awesome wine, and a fantastic pairing! If you love Oregon wines, this is one winery you should be following, and it’s a great one to celebrate Oregon Wine Month with. Boom! For more recipes with wine pairings check out the Recipe Index. 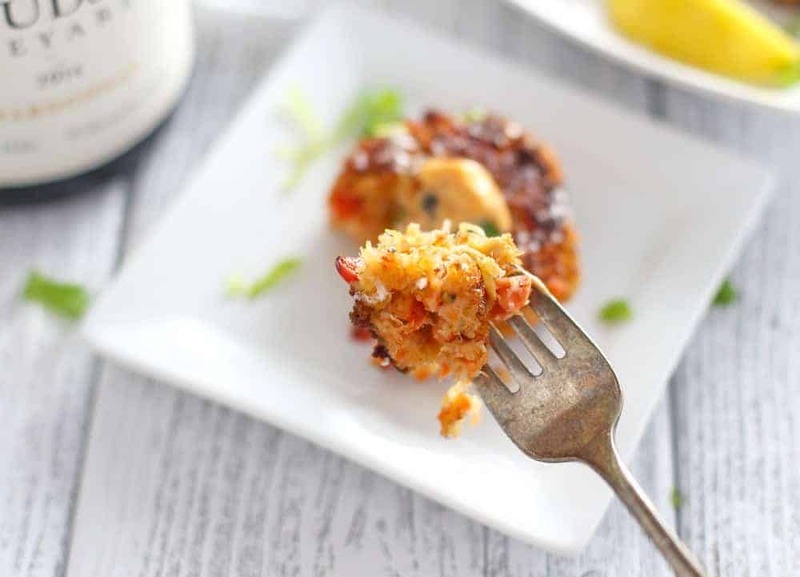 I’m ok with crab cakes, though I would never order them off a menu I will eat them when presented – but the idea of mixing crab with smoked salmon, now that I would definitely get! I don’t have an aversion to mayo, but you’re right that often with crab cakes they depend on the may too much to not be dry so I appreciate that you found another solution for that! That sounds really great. 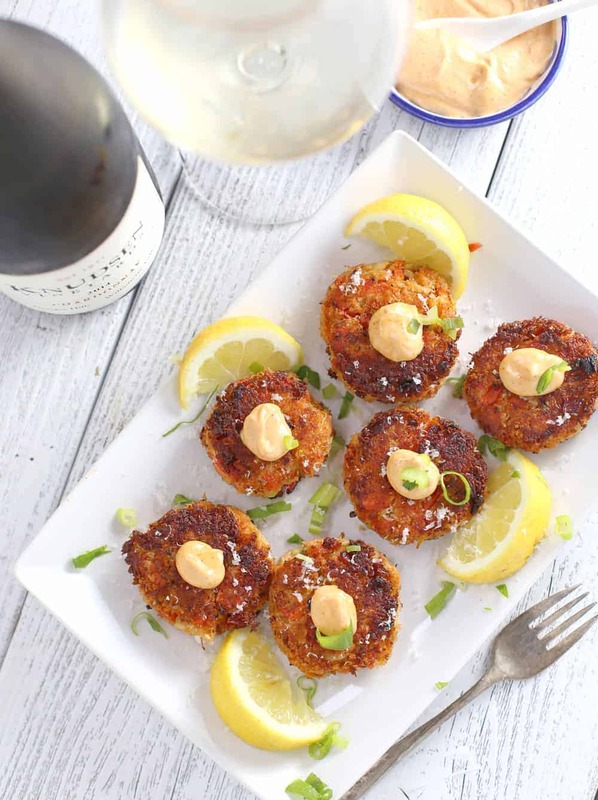 I love crab cakes, but agree they are spendy so this is a fun way to mix them up with salmon. Do you think you could just use pre-smoked salmon instead if you don’t have a smoker? Absolutely!! In fact I meant to mention that in the post! I’ll go update it. I would recommend to either cook on the stovetop or roast a salmon fillet, then let it cool enough to work with, then follow the instructions in the recipe. 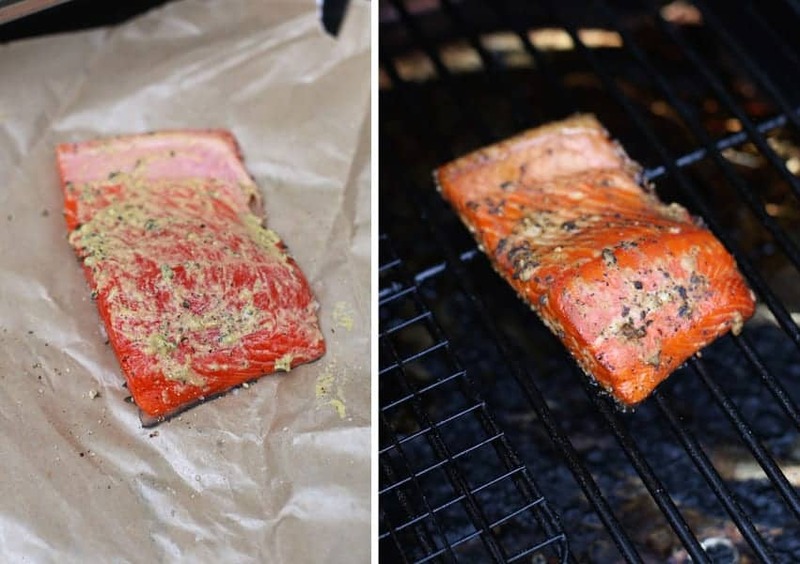 You won’t get that smoke flavor, but the texture and salmon flavor will still come through. And the salmon will still have that oiliness that will sub for some of the binding. IF you by a “pre-smoked” salmon just be weary of what you are buying. You don’t want “lox” or cured, or cold smoked. You want one that has been cooked (hot smoked). The pre-smoked (not-smoked) ones also come out pretty dry in my opinion. So just be aware of that when you are mixing everything together. You may need more binding. The best way to go would be to cook the salmon fillet yourself (either in the oven or stovetop, or on the grill if you have one). Ooh dungeness crab AND smoked salmon in one seafood cake? Delicious! And I love the pairing with this Knudsen Chardonnay. I’m fairly certain I just drooled all over my keyboard. These look phenomenal!! And I completely agree on the crab cakes comment, I haven’t found one I’ve liked yet but I’m definitely saving your recipe to try. Pinning! 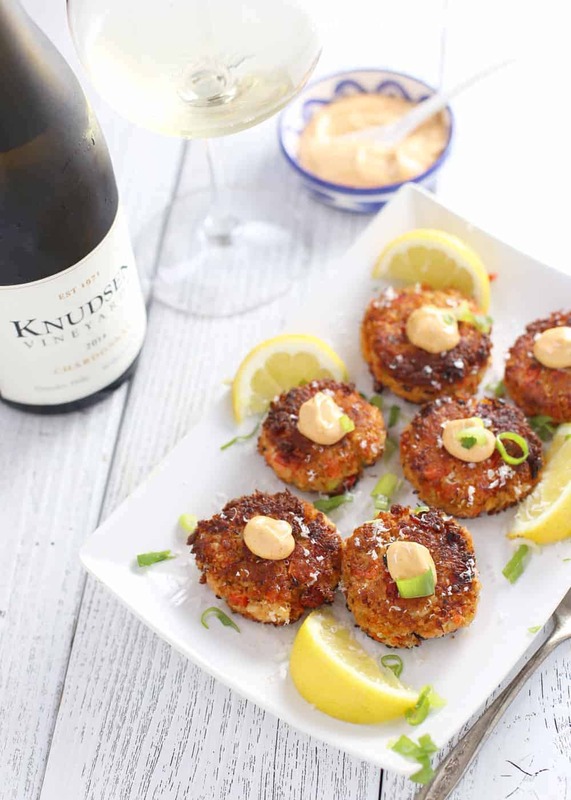 I loooooove crab cakes so I’m sure these are mouth-watering! Great idea to mix the crab with the smoked salmon and combine flavors. These sound absolutely amazing! 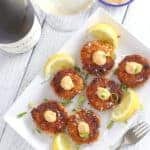 I am usually not a fan of crab meat, but I adore salmon, and I truly think that these flavorful smoked salmon crab cakes could do just the trick to make me fall in love with crab. =) And this Chardonnay sound divine! I love your blog. Have you tried fresh Dungeness crab? The flavor is so fresh and slightly sweet. So so so different from other crab meats you usually see. But YES, mixed with the salmon is outstanding! 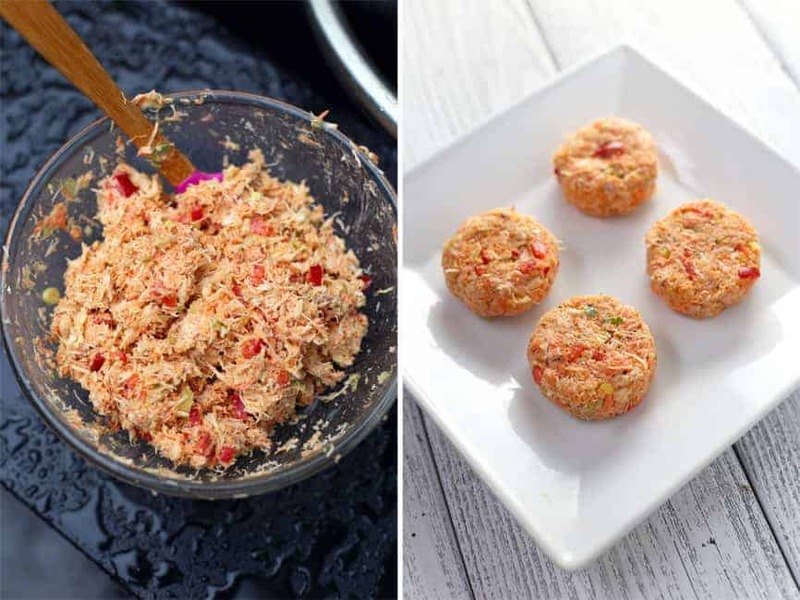 What a brilliant idea – salmon and crab cakes! Two of my favorite seafoods in one – love it! Our friends introduced us to Oregon wines during a visit to the west coast and I have to say I was very impressed. This one sounds like my kind of Chardonnay, a little oaky yet fresh & clean. Great post! I’m unfortunately not a seafood gal myself, but my fiance IS…and this looks amazing. I’ll have to make it for him next week!! Holy cow, can’t wait to make these for VDay! !